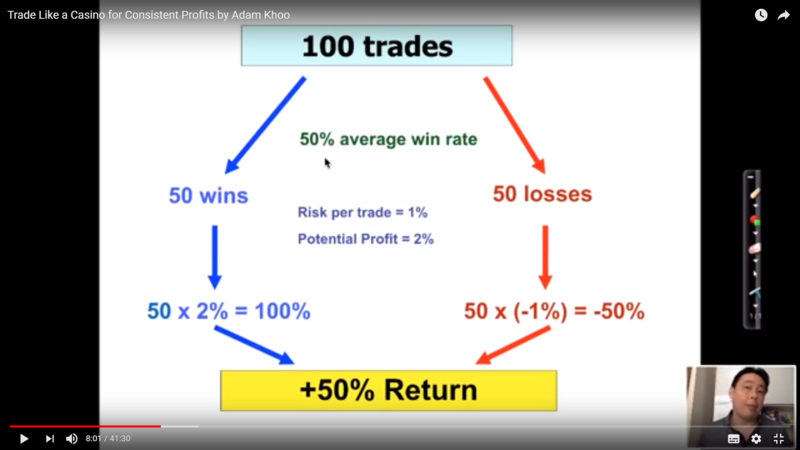 I was listening to this youtube video and the author is explaining that good way is to set up forex trades in a way where 10 pips in 'losing' direction (Stop loss) and 20 pips in 'winning' direction (Profit Target) and then getting 50/50 win-loss you will come out on top since you gain more by winning and lose less by loosing. I must be missing something here. Is forex trading where winning pips are twice as far from the cut of is a good strategy? If you have no edge, then you would indeed expect twice as many losing trades as winning trades, so you would net out to zero return on average (negative after commissions and trading frictions). This is a special case of the mathematical result known as the gambler’s ruin problem. If markets are not random, but exhibit either short-term momentum or short-term reversion, then the advice is different. The advice to set profit stops twice as far from the entry as stop losses is a form of “cut your losses short and let your winners run on”, or more succinctly “the trend is your friend”. If markets exhibit short-term momentum then past winners are more likely to continue winning and past losers are likely to continue losing. In this case, it makes sense to hang on to winners and cut losers quickly. On the other hand, if markets exhibit short-term reversion then the reverse is true - you should take profits quickly and hold on to your losers, waiting for them to come back. So whether you follow this advice should depend on whether you think markets have short-term momentum, short term reversion, or whether you think they are close to random walks (in which case you should not trade). A more practical piece of advice is - the author of this video is wrong and you should not listen to them. Probably, you should not day trade forex at all. Most day traders lose money. Not the answer you're looking for? Browse other questions tagged fx strategy or ask your own question.